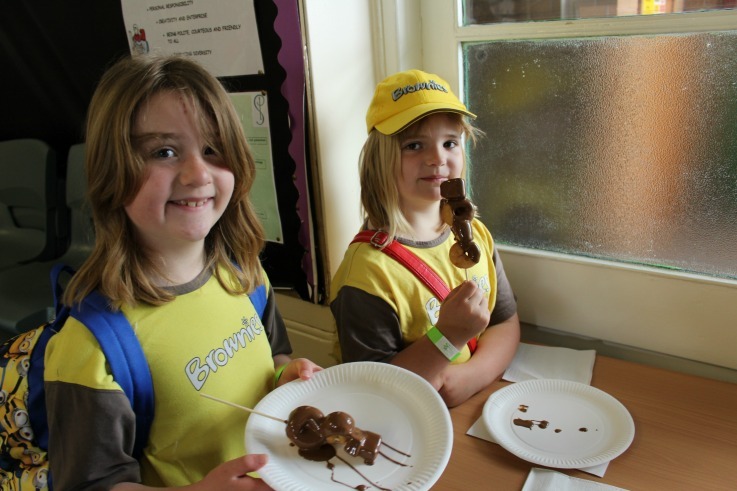 On 8th May, over 400 brownies from across Shropshire attended our Whizz the World fun day, involving activities in zones based on each of the countries which house our World Centres. Girls were able to practice milking a cow and sample our chocolate fountain in the Switzerland section, learn Bollywood Dancing and try on traditional saris in the India section. The Africa section involved an African drumming workshop and giraffe-making, whilst Mexico was home to a cactus hoopla and girls were able to make Mexican Gods’ Eyes, amongst lots of other crafts and activities across all sections. At lunchtime, all Brownies gathered in the main hall with the Rainbows who were enjoying a separate programme of activities, to celebrate the Queen’s Birthday. Everyone was given a flag and a cupcake decorated with a picture of the Queen for a celebration led by the town crier.